Small, intimate nuptials should be just as memorable and just as special as any big celebration. We are the perfect choice when you want to keep things small and intimate, when you want to get married in a short time frame, or when you don’t want to spend tens of thousands of dollars on a big wedding. We make it special with a wonderful ceremony, professional photography, and the perfect extra touches. We keep it easy so all you have to do is have a great time. Pick a favorite location or enjoy all the amenities at the Tuscany Gallery, a beautiful indoor venue designed specifically for small weddings and elopements. Easy! We do all the work so all you have to do is have a great time. We’re thrilled to announce the opening of the Tuscany Gallery. This beautiful venue is designed specifically for small weddings and elopements. Get the outdoor courtyard wedding feel with all the convenience and comfort (and weather protection) of an indoor ceremony. Designed to look like an Italian courtyard at night it features amazing greenery, cobblestone floor, four-tier fountain, a beautiful rose and peony decorated garden gate and trellis, and romantic lighting. The Gallery offers two elopement packages and three small wedding packages that include everything you need: cake, flowers, music, officiant, amazing decor, and great photography. Ceremony only or we can even host a small reception. Visit www.TuscanyGalleryandEvents.com, our Facebook page http://www.Facebook.com/TuscanyGallery. Call 636-345-1945 or email weddings@TuscanyGalleryandEvents.com for a personal tour. Just because it’s small doesn’t mean you shouldn’t have great photography to capture your memories. 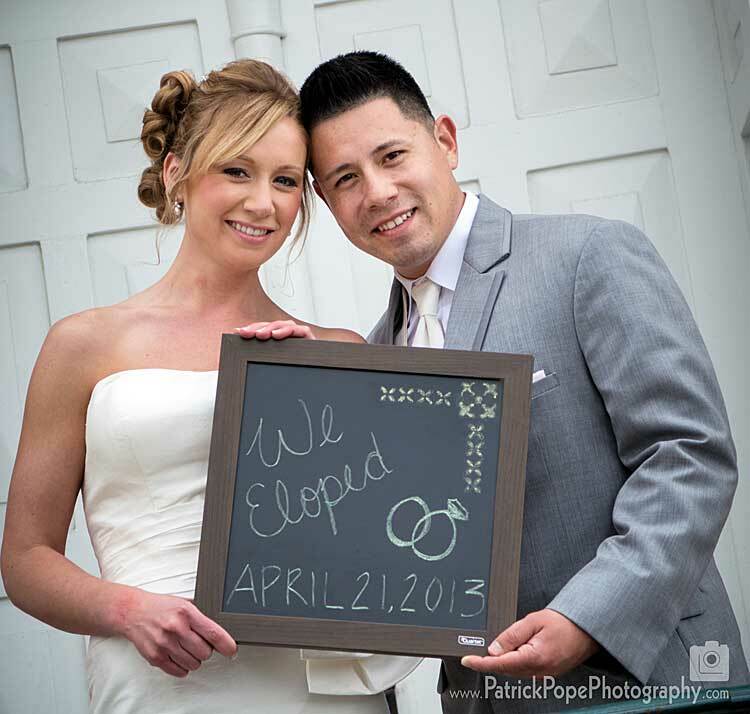 We work with Patrick Pope Photography, one of the area’s most respected wedding photographers, to make sure your photos are wonderful memories, not just say-cheese snapshots. We add the perfect extra touches to make your elopement something memorable and special. Flowers, cake, a sand ceremony or unity candle, even a butterfly or dove release are available. Although we make your celebration special and memorable, there is a difference between an elopement and a small wedding. Elopements are very small affairs with only a very few select friends and family and the ceremony is short, but sweet, at ten to fifteen minutes. Because it’s small and doesn’t require a great deal of time, your elopement can often be at a location that’s completely free of charge, unlike a wedding that requires a rented location. Popular locations are parks or even your own home. Some locations, such as the Butterfly House in Chesterfield, charge a small fee, but it’s often significantly less than what would be charged for a full blown wedding with a hundred guests. In order to capture the true spirit of an elopement, we do limit the number of attendants and guests. The number of guests varies from just a few with the intimate Cupcake Package to roughly 20 to 30 with the Vineyard Package. Weekdays are very popular times for couples to elope while most full blown weddings take place during the weekend. And, of course, cost can be a huge difference between an elopement and a small wedding. Many couples simply don’t feel a full wedding is the best use of their hard earned money.